I was just reading announcements of new synthetic chemicals (SweetMyx) to enhance the taste and help reduce sugar and salt in "health foods". The new taste enhancers have already been approved by industry organizations that designate the chemicals as GRAS, generally recognized as safe. I, of course, was curious about how the SweetMyx chemicals made food taste sweeter with less added sugar. Notice how convenient it is that the food industry has found a way to charge more for less sugar, just as labels have been changed to specifically designate "sugar added:". I searched the chemical literature for new taste enhancers, since the chemical ingredients in SweetMyx are trade secrets and will not be disclosed on food labels. It didn't take long to find that the likely suspects are called alapyridains. This group of related chemicals are synthesized with a central pyridine ring familiar from the related cytosine and thymidine of nucleic acids, the plant alkaloid nicotine and the vitamin niacin. A guanide group (half of the diabetes drug metformin, which is a biguanide) is added to make a salt enhancer, and a benzene ring is added to make a sugar enhancer. Without these additions, the central structure inhibits the ability to taste the bitterness associated with "healthy plant antioxidants," phytochemicals and essential oils. Will SweetMyx Just Tickle your Taste Buds? The alapyridains that I expect to be in SweetMyx seem to be similar to common plant alkaloids, which are natural pesticides and antibiotics, i.e. phytoalexins. So I would expect these compounds to also be antibiotics with unknown impact on our gut flora, nervous and immune systems, just like all of the medical antibiotics. 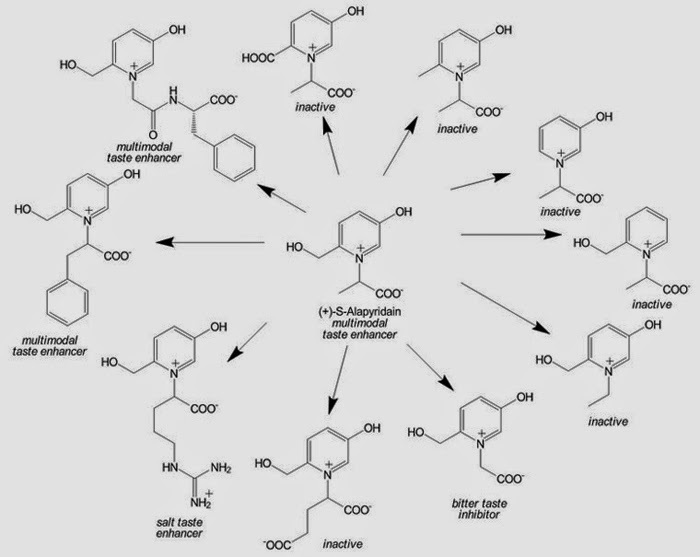 Based on the general putative structure of the taste enhancers and similarity to other molecules with known reactivities I would also expect these molecules to react with enzymes that bind sugars, e.g. glycosidases, or with hundreds of other proteins that bind to heparin, e.g. embryological growth factors, clotting factors, cytokines, amyloids, etc., etc., etc. It would also be expected that these enhancers will encourage consumption without satiety and therefore, just as artificial sweeteners, contribute to further obesity. In other words, these taste enhancers can be expected to have numerous, unpredictable medical and ecological side effects that will not be understood for decades.